Michele Whiteaker travels when she can and blogs about her local adventures at FunOrangeCountyParks.com where she promotes play and encourages family outdoor time. She’s also a 2011 Superoo who’s happy to answer specific questions about her stay at Loew’s or any of her other Trekaroo trips. Drop her a line! 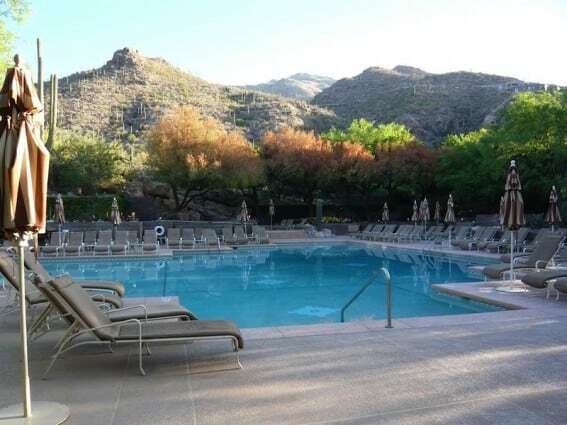 We knew we were in for a different kind of stay from when we read the website directions which said: “Turn right at the boulder.” The kid friendly Loews Ventana Canyon Resort rests high above the Tucson valley floor in the foothills of Ventana and Sabino Canyons. Upon our arrival, my family immediately spotted a Gambel’s Quail and red Arizona Cardinal. Saguaro cactus tower at the entrance and interpretive signs label every bit of flora and fauna on the grounds, so when the kids ask you “What is that?” you will have an answer for them. Before we could even check-in, our kids headed straight across the lobby toward the big glass windows revealing a waterfall and koi pond. The concierge saw our excitement and provided us with “koi treats” from their special treasure chest. What’s the best place for Mexican food? Could I sign the kids up for the Coyote Club? 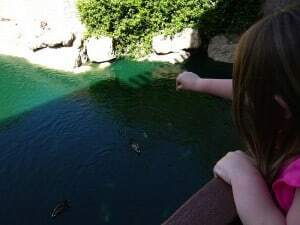 How could we visit Sabino Canyon? Victoria took care of it all with a flurry of activity in a manner of minutes. El Charro was located right down the hill from the resort. Victoria called them and made reservations. The kids were signed up for the Coyote Club and instructed to meet in the lobby the next morning. 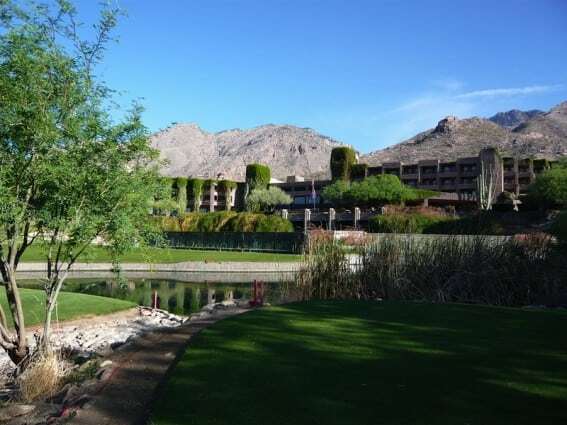 A hotel shuttle was booked for Sabino Canyon the next day after the Coyote Club ended. Each booking was accompanied by a card detailing the activity and details. Impressive and appreciated! We received a tri-fold glossy brochure upon checking-in labelled “Weekly Activity Guide.” It outlines Coyote Kids Club activities, plus other special opportunities for families. We used the guide to plan on seeing the Saturday night Dive-In movie at the pool and stargaze with a professional astronomy educator. A real vacation for me is one which takes away the hassle of decision-making. This place really fit the bill for this Mom. 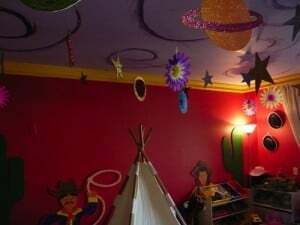 We have NEVER turned our kids over to the hotel “kids camp” programs, but after chatting with the concierge it seemed like the Coyote Club could entertain the kids better than we could. Jacqueline has been involved with the program for over 14 years and has some really extraordinary experiences planned for kids ages 4-12 years old. The kids were with her from 9am to 1pm which gave them time to embark on a photo safari of the property, eat lunch, and get a behind-the-scenes tour of the hotel workings. In addition to a great experience for the kids, it gave my husband and me time to: explore the hotel and grounds and have a quiet lunch date together at El Charro. The best part came weeks after our visit, when a brightly-colored envelope arrived in the mail. Jacqueline had personally scrapbooked our kids’ time in the Loews Ventana Canyon Coyote Kids Club. Looking for more fun in Tucson? Check out the best of Tucson for families. Definitely talk to the concierge upon your arrival. She can help you plan out an individualized stay. There’s a Basha’s Market and a number of restaurants near the hotel. It’s very dry in the desert, so bring lip balm, lotion, sunglasses, a hat, and flip-flops. Make sure you hydrate often! For a true Tucson experience, keep your eyes out for bats at dusk. It was really cool to see the bats swooping for insects at twilight. They even scooped up dinner near the pool when it was dark. The balconies were solid at the bottom so there were no railings that were safety issues. Pets are allowed at this hotel and they even had entrees for dogs and cats on the room service menu! Loews bills themselves as family-friendly with their “Loews Loves Kids” program. My kids got gifts upon check-in (little toys and books) and were treated very well throughout our stay. Time your reservations at the Flying V Bar & Grill for the patio at sunset. Munch on their yummy cornbread, order guacamole made tableside, and save room for the dessert menu. Read my review with more info about the room, the pool, and the amazing Ventana Window Walk. Disclosure: The author received a complimentary stay and meals at the resort in order to complete an unbiased review and this subsequent article. The resort did not request that any specific opinions be expressed. What a cool place! I love the room for the kids!